Nestling in a beautiful, forested valley, the stunningly pretty little town of Morzine has a quite unique charm with its traditional chalet-style architecture and a friendly, relaxed atmosphere. Morzine's breathtaking setting of towering mountain peaks, pine forests and serene lakes combines with the excellent range of activities available (many of which are included on the excellent Multipass card - see below) to make Morzine an ideal base for a memorable alpine holiday. From endless footpaths and trails for excellent walking or mountain biking opportunities to rafting, horse riding and climbing, Morzine and neighbouring Avoriaz offers something for everyone. The picturesque town centre has a wide range of good value, quality shops, restaurants, cafés and bars as well as a cinema. Morzine is also an excellent choice for families with an array of activities on offer. Spend an afternoon at the water park, try summer tobogganing, visit the local cheese dairy or just relax and enjoy the amazing scenery. Situated in a sunny position 3 minute walk from the village centre, this spacious, comfortable hotel is beautifully appointed and offers excellent facilities and plentiful, high quality food. Enjoying a peaceful location just a minute's walk from the centre of Morzine, the Champs Fleuris, tastefully decorated throughout in wood, is an excellent family-run hotel offering great facilities. A wonderfully French hotel with welcoming family atmosphere, just 8 minutes from the centre of the resort, in extensive grounds with its own mini-farm (including deer, duck and hen). The lovely family-run La Clef des Champs, positioned in a fabulous location just 300m from the resort centre has its own spa and outdoor covered pool. This hotel provides all the ingredients for a perfect summer holiday! This lovely family-run hotel in the centre of Morzine is renowned for its excellent home-made cuisine, friendly welcome and facilities with the lovely swimming pool and lovely quiet adjoining garden. This comfortable hotel is an ideal choice for families and keen walkers. It has a great location, only 50m from the resort centre and the Pléney lift, allowing quick access to the hiking and biking trails. Discover the canals and beautiful historical buildings to see why it is called the ‘Venice of the Alps’. Take a boat trip on the beautiful lake, browse the colourful market set at the foot of the magical chateau and explore the narrow streets and walkways. A wonderful town with stunning vistas of Mont Blanc and its dramatic glaciers. Take a trip to the famous Aiguille du Midi or the Mer de Glace (payable locally). Book locally | Prices for guidance only. An hour drive over the Col de Joux Plane takes you to Sixt Fer à Cheval, classified as one of the most beautiful villages in France. Enjoy a 3 1/2 hour walk through the nature reserve, featuring cascading waterfalls and flora and fauna in abundance. Optional extra to visit the Jaysinia Botanical Gardens in Samoëns. Many more options available locally through your Representative. All excursions are subject to minimum numbers. Holidays in Morzine transport you to a land of towering mountain peaks, pine forests and serene lakes. These features combine with the excellent range of activities available to make Morzine an ideal base for a memorable alpine holiday. From endless footpaths and trails for excellent walking or mountain biking opportunities to rafting, horse riding and climbing: Morzine holidays offers something for the whole family. The picturesque town centre has a wide range of good value, quality shops, restaurants, cafés and bars as well as a cinema. Spend an afternoon at the water park, try summer tobogganing, visit the local cheese dairy or just relax and enjoy the amazing scenery. 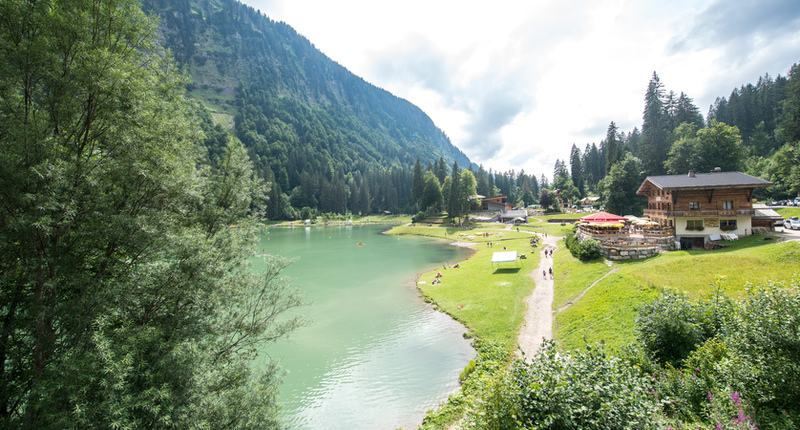 Hundreds of kilometres of marked footpaths for all abilities await you in the stunning mountains surrounding Morzine. Enjoy an easy stroll along the river Dranse, a moderate ramble up to the serene Lake Montriond or a more challenging hike via the spectacular Nyon waterfall. Enjoy the panoramic chavannes walk to Les Gets and return by bus (included with Multipass Resort Card). Two Centres | Many guests like to combine their stay in Morzine with another resort, such as Grindelwald, Interlaken, Montreux, Mürren, Saas Fee, Wengen, Wilderswil, Zermatt, Talloires or Chamonix.